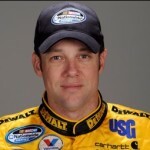 Matt Kenseth on Nationwide pole at Richmond. Matt Kenseth, winner of the first two Sprint Cup Series races of the season, won the pole for Friday night’s Nationwide Series race. Kenseth knocked Mike Bliss off the pole at Richmond International Raceway with a lap at 124.821 mph around the .75-mile oval Friday afternoon. Bliss held on to the outside pole with a lap at 124.769 mph. Kyle Busch, who is the series points leader, will start the Lipton Tea 250, third. Fourth will be his Joe Gibbs Racing Teammate, Joey Logano.